I train inconsistently and get injured a lot. There, I’ve said it! Six days training after a week off isn’t good for me, particularly when I don’t get into the habit of stretching before and after explosive workouts. My most recent injury is a pain in my right knee. I had it last year and it was summarised by a physio as anterior knee pain, which can be attributed to one of many causes, so I just tolerated it and reduced my running escapades. I resorted to wearing a knee brace, even when ascending Denali. This year, the same pain is back, again after a quick build-up of my training regime, leading me to think it’s brought on by muscle and tendon tightness pulling my patella off centre so it doesn’t track correctly. 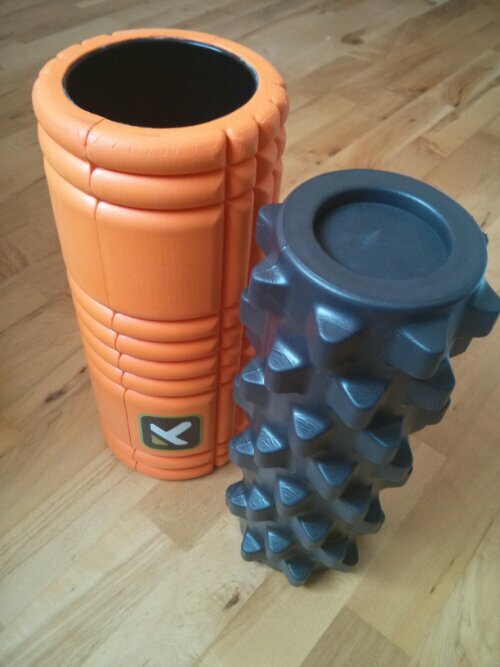 With a race on the horizon, I reverted to using my trusty foam roller – a little orange number by Trigger Point. It’s a step up from the compressed foam rollers at my gym which have long since been squished out of shape. I’ve been using it for a couple of years on and off (more when I’m injured) without it losing its structure and it has helped to loosen up my quads and my ITBs after a lot of exercise. However, there was still something not right with my musculature that my trusty orange roller could not tackle, so I decided to bring in the big guns – the Rumble Roller. I even decided to o get the extra firm model. Using the Rumble Roller when you have tight muscles and tendons is not a pleasurable experience. The first time I used it I built up a sweat keeping myself in position whilst this brutal piece of kit worked the length of my iliotibial bands, quads and adductors. However, it’s amazing at finding small knots and easing them out. Bit by bit I managed to ease out the kinks in my leg muscles which were causing my knee pain. It cost the same amount as a sports massage but I should get years of use out of it, so I’m calling it a wise investment. After three days of using the orange then black foam rollers twice a day, plus light exercise and copious stretching, my legs are back to feeling human again, most of my knee pain has subsided and I feel 90% fit to run my road race tomorrow morning. Result! Do you use it everyday or just on days when you work out? Or is that the same thing? Hi, thanks for reading my blog. I would ideally use my orange foam every day that I work out; it only takes a couple of minutes and saves many days of sub-par training due to injury and muscle tightness. I would caveat that by saying that it complements traditional stretching which in itself is a great way to prevent injury.